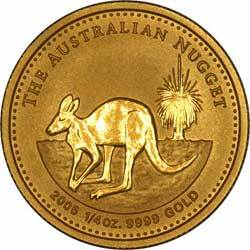 Everything you need to know about Australian gold nuggets and kangaroos. 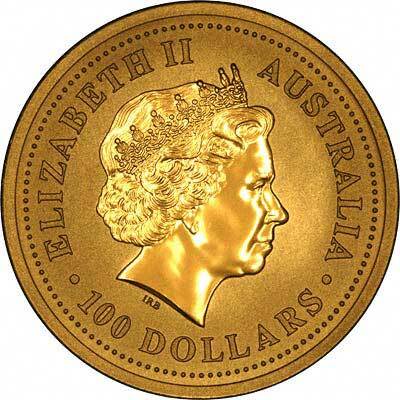 Many countries now issue a one ounce bullion coin, to be sold at a very low premium over the intrinsic gold value. 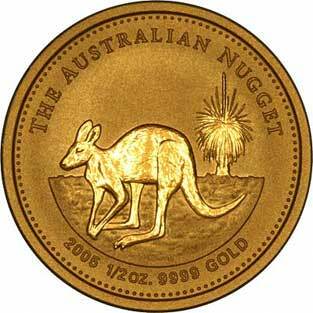 The Australian version is the Nugget or Kangaroo. Because Krugerrands were the first one ounce gold bullion coins to be issued, it is worth comparing gold nuggets with Krugers. Krugerrands were first issued in 1967, as one ounce bullion coins. From 1980, they were also produced in fractional sizes of half ounce, quarter ounce, and tenth ounce. Nuggets were introduced in 1986. 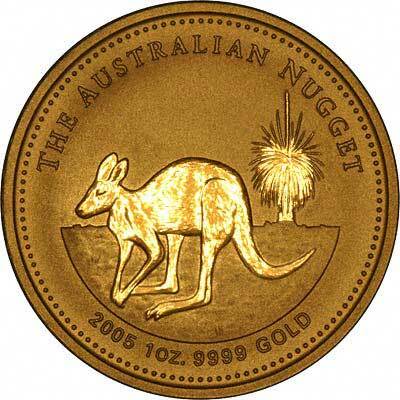 During the first few years of their issue, the design on the reverse of the Australian Nuggets was, somewhat originally, Australian nuggets. Each of the four sizes carried a picture of a different famous gold nugget. For more information about the designs on different sizes and dates of Nuggets, please see our Nuggets Designs page. Gold Nuggets are available in four different sizes and weights, from one ounce to one tenth of an ounce, as detailed below. 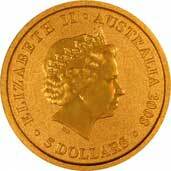 The obverse bears a portrait of H.M. Queen Elizabeth II. 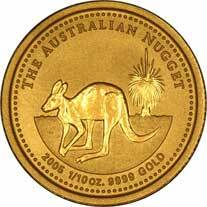 The reverse designs of Australian gold nuggets feature individual themes. As with most one ounce gold bullion coins, they are made available to world bullion dealers at a 3% premium over the current gold fix, so that after distribution costs, the coins would be available to investors in quantity at about 6% to 7% over intrinsic gold values, and possibly 12% premium for single pieces. The fractional sizes were issued at higher premiums to bullion dealers of 5%, 7%, and 9% respectively. The fractional coins have never been as popular as the full one ounce coins, usually only being purchased as singles, so that in practice, it would usually cost 10% to 25% premium for the half and quarter ounce, and from 20% to 35% premium for the tenth ounce, most of which seem to have been used in jewellery. Most bullion houses do not want the bother of handling small quantities of low value coins.